Learning how to pack fragile items properly is a matter of sufficient preparation and having the right tools. Remember your last move when you broke the heirloom china then tried to glue it back together? After several tedious, determined hours your hard work simply revealed horrid grey glue scars all over your dishes. Don’t risk ruining what you cherish again. The following are some of our favorite simple tips for packing fragile items safely and securely. Packing porcelain, valuable crystal and other fragile items should not be rushed. If you’re not hiring movers, start packing these items well in advance of moving day. Give yourself at least eight weeks prior to the move date. Since fragile items are often heirlooms and/or used on special occasions, they may even be the first items you pack. You will need lots of quality boxes in various sizes. 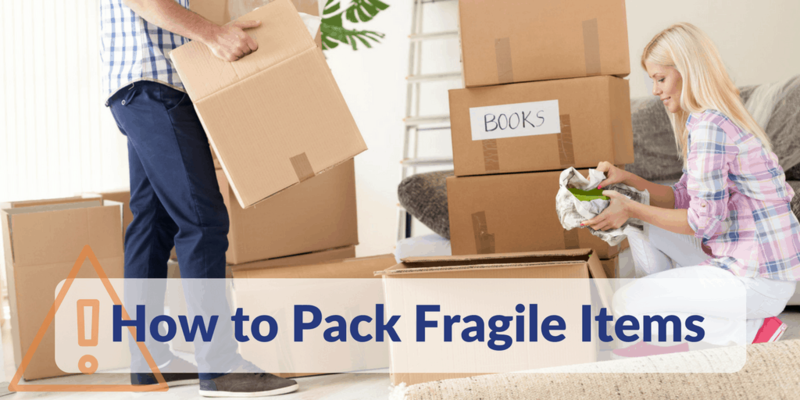 Other materials you’ll need to pack fragile items include bubble wrap, tape, packing peanuts / pellets, pliable cardboard, packing paper – plus a thick black marker to write ‘FRAGILE’ on the top and sides of every box along with the area of the house it will go to and its contents. Also essential is a large table where you can lay out items. It’s important to have paper proof to back up the worth of your items in case something breaks or gets damaged en route. For electronics and other retail items, a sales receipt will do just fine. If you don’t have a sales receipt, try and find your item or a comparable replacement online and print out the pricing information. For jewelry, heirlooms, and antiques, get a signed appraisal from a professional. It may cost a little up front, but it will save you more if you get into trouble later on. When packing fragile items, start with a layer of packing material such as bubble wrap, packing peanuts, or polyethylene foam at the bottom of the box. If you’re able, pack fragile items in their original boxes. Pack particularly delicate, costly, or cherished items in smaller separate boxes before adding them to a larger moving carton. The heaviest items should always be placed on the bottom of the box with lighter belongings on top. Plates – Dish packing boxes are specifically designed to protect your fragile dishes and make packing easier. Pack plates vertically in small to medium boxes lined with crumpled packing paper bottom and top. Individually wrap each plate in bubble wrap and secure with packing tape. Place paper or peanuts between the plates. Do not over pack the box. Glasses – Wrap each glass individually with packing paper or bubble wrap. Glasses are most adequately protected from damage when they are packed in boxes that are divided into individual cells. If you’re using a normal box, put crumpled packing paper or peanuts inside larger spaces to prevent empty space. Line small or medium boxes with plenty of packing paper, both top and bottom. The space around glasses should be layered with paper as well. Lamps – Lamp shades should be boxed (flat side down) separately with ample packing paper. Lamp boxes can be packed in a large box as necessary and wrapped carefully with bubble wrap. Frames/Pictures – Place picture frames in lined small to medium boxes, standing if more than 8 inches, with crumpled paper or peanuts between each piece. Wrap the frames in packing paper to ensure items don’t move around in the box. Pictures more than 3 feet in size should be secured with a moving blanket, wrapped in bubble wrap or plastic, and moved separately. Specialty Items – This can be applied to all oddly-shaped, large fragile items. First, consider the shape and size of the piece, as well as any protruding parts or handles that could break easily. Completely wrap the piece in bubble wrap and secure it with tape. Place it on a piece of pliable cut cardboard. Put an identical piece of cardboard on top of the item. Next, manipulate the cardboard edges to meet and secure them with tape and use plenty of it! The fragile item should be fit snug and stable in the cardboard. Place the item in a paper lined box similar in size to the item, putting crumpled paper and/or peanuts in any gaps. Tape up the box securely. Many folks use old towels, small blankets, newsprint, or even paper towels to wrap fragile items. These aren’t the best choices. Newsprint transfers ink to hands and items which means you’ll have a lot of extra washing to do in your new home. Paper towels aren’t strong or reliable. Old towels slip easily and can’t be properly secured with tape, which is necessary for packing valuables. Invest in the right tools, give yourself time and you can worry a little less. Let your movers know which boxes contain fragile items. If you have any qualms about how to pack your breakables, seek help from professional movers. Pack computer components and electronics like amplifiers, DVD players and Blu-rays in their original boxes. If you can’t, choose a box that’s slightly larger than the component being packed to allow enough room for the packing materials. Media should be removed from units before they are packed. Lock any lasers in your CD / DVD Player / Blu-rays. Be sure your files are backed up and discs are removed from your computer before it’s packed. Label wires, cords, jacks, then place them in clear plastic bags and secure them with tape to the inside of the box where corresponding items are located. Document the details of each valuable fragile item: name of the item, what it looks like, existing damage, serial numbers, etc. Take photos or videos of fragile items before, during and after the move at a number of angles so if damage occurs, you have evidence. Pack valuables in your personal vehicle or by your side in the cab of the moving truck, so you know where they are at all times. Check and see if the homeowner’s policy covers loss or damage to items while moving, and if it does what the stipulations are. If it doesn’t, consider purchasing a rider policy from your agent. If you’re using a moving service, pay for Full Valuation Insurance. It isn’t a catch-all, but it’s much better than the regular Standard Valuation Insurance, which only pays you $0.60/pound for lost or damaged items. Seriously think about this option. With Standard Valuation Insurance, if your 30 lb flat screen TV is smashed, you will receive $18 as compensation… assuming there is no deductible. Seriously? If you know how to pack fragile items properly, you can avoid the heart-break of your porcelain figures breaking into a hundred pieces during transit. Simple Moving Labor hopes these tips help make your move less complicated and stress-free. Do you have any wisdom to add about how to pack breakables? Did our advice help you? Feel free to comment below!